Hibbertias are commonly known as Guinea Flowers and this name refers to the resemblance of the flower shape and colour to the ancient Golden Guinea coin. Hibbertia scandens grows naturally along the coastal fringe of South-eastern New South Wales to north-east Queensland from coastal dunes to forested areas. It is a fairly vigorous climber or scrambler, growing to 2 to 5 metres long. 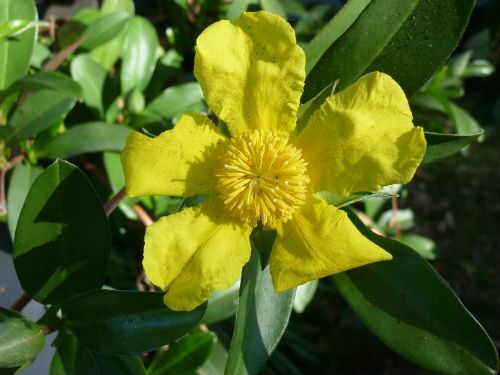 The large golden yellow flowers, 5-7cm across that appear in spring and summer, complement the glossy green leaves very well to make an attractive climber. After the flowers finish they are followed by attractive red fruits and these seeds are reported to be slow to germinate. Every now and again, I have a bunch of seedlings growing from under my plant, so germination does occur naturally in the home garden, if you are patient. The easiest way to obtain new plants is by cuttings which gives good results. This species is commonly cultivated, and is able to grow in a wide range of condition but will flower at its best if grown in full sun. 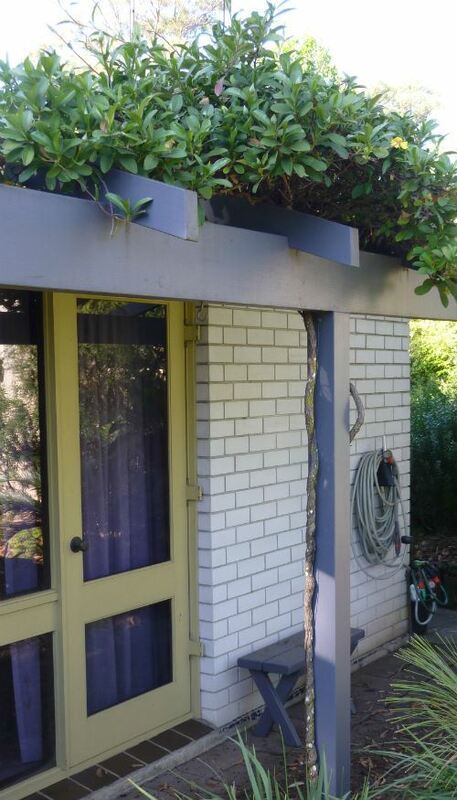 I have trained this plant to grow up and over a narrow trellis outside a bedroom window (see photo) and it is performing well as it is not too vigorous and only needs minimal training and pruning. I have found out, over the years that many native and non-native climbers are too vigorous for smallish areas, as they grow far too fast to reach the sun and all growth is at the top, usually not where you would like it to be. For the stamp collector it is worth noting that Hibbertia scandens appeared on an Australian postage stamp in 1999. In researching this article I found reference to the fact that the yellow flowers have been reported as having an unpleasant odour. I have not noticed this, however I must say that I am one of the few people who can’t smell the very fragrant brown and yellow Boronia scent that growers rave about. The species was first formally described in 1799 by German botanist Carl Willdenow who gave it the name Dillenia scandens. In 1805, Swedish botanist Jonas Dryander transferred the species into the genus Hibbertia. Hibbertia is a genus of around 150 species, most of which occur naturally in Australia and have bright yellow, buttercup-like flowers. Hibbertia… after George Hibbert, a patron of botany. Scandens… is derived from Latin, and means "to climb".